Start your review of Stephanie Wolanuk. Send a message to Stephanie Wolanuk. Thank You! 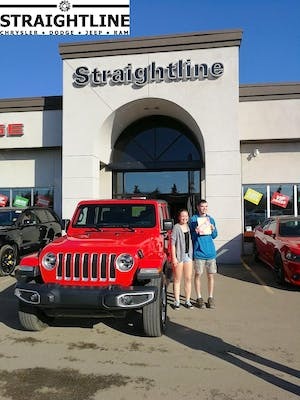 Your message has been sent to Stephanie Wolanuk at Straightline Chrysler Dodge Jeep Ram. Straight line made my purchase very easy and quick. Very friendly sales person and let me make my decision with no pressure. I am very impressed. I recently purchased a 2015 Dodge Durango from the team at straightline and am beyond satisfied with them. I live in the Yukon and they had the most wonderful couple drive it here for me at no extra charge. Living in the Yukon there is not much for options compared to places down south so I was very pleased they were willing to accommodate me. The sales associate Steph was amazing right from the start down to earth and the finance team Amber and Karen were very patient with me and my schedule. Thanks again guys will be sending you more business that’s for sure!!! 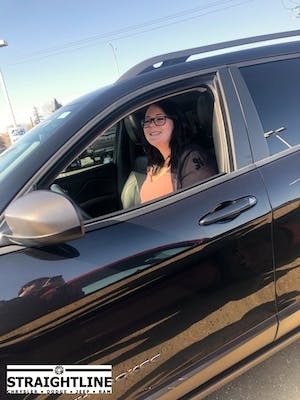 Upon entering the show room, everyone we were in contact with seemed to want to help us out and we were quickly directed to Stephanie our sales person. 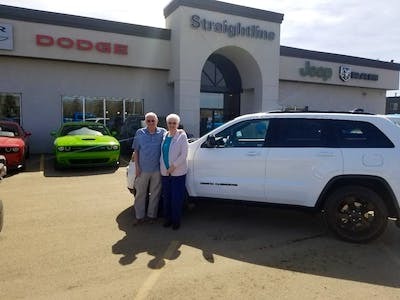 When we described to her the type of vehicle we were interested in, we were given choices of which new Grand Cherokee's were available with the options we were looking for. They found us the perfect vehicle with more options then we asked for, but for such a great price we could not refuse it. VERY SATISFIED CUSTOMERS., THANKS. When we picked up the vehicle, Chad went through al the aps. with us, he was extremely patient and helpful, and gave us all the help we required. Great team who worked very well together to get us the vehicle we wanted for the price we wanted, as well as getting our addons installed quickly! Needed a truck and Stephanie got me one. She was great to work with, very helpful. I would recommend her for sure. Thank you Stephanie. I began dealing with Stephanie and Jake from the sales department over a kijiji ad, they were extremely responsive, positive, polite and not pushy, they promptly answered any questions I had and were very easy to negotiate with. I’m extremely happy with the deal we reached! Once I began dealing with Amber from finance, I was very pleased to be treated with the utmost respect, she took the time to walk me through every aspect of the deal, warranties, and add ons. She kept mentioning if she gave me any better deal, she might not have a job tomorrow hahah. We managed to sort the whole deal over the phone, and she even registered the truck for me, so when we came on Saturday there wasn’t any issues. Once we finally made it in, the paperwork 100% matched what we had discussed, no hidden costs, no extra fees, everything was exactly as described. Jake even took my son over to one of his favorite cars, an SRT8 Challenger and let him sit in it while Amber and I finished paperwork. The truck was immaculate, and as described with no surprises. I’d give this dealer a 10/10, they have great staff, and I look forward to dealing with them again in the future! Thanks again, Amber, Jake and Stephanie! "So pleasant and stress free!" 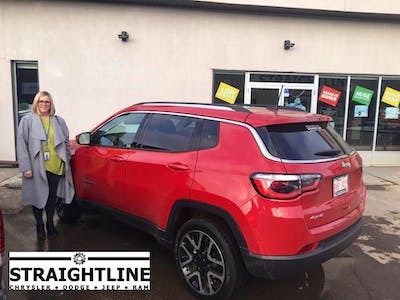 Our experience at Straightline Chrysler was nothing short of amazing! The 3 wonderful ladies we had the pleasure of dealing with were absolutely wonderful. Stephanie was so helpful and pleasant. Her knowledge and confidence was so reasurring and she made us feel at ease knowing we could trust her to get us ecactly what we wanted. We then dealt with Karen and Amber for financing and they were both so amazing. Amber worked so hard for us and was on top of everything at all times. You can see that everyone there is a team and their business runs so smoothly. Huge 2 thumbs up. I will definitely be reccomending Straightline Chrysler whenever I can! I’d like to thank Stephanie, Karen and Mark for their patience and assistance in helping me pick out the right Jeep for me. They were super helpful and accommodating! !